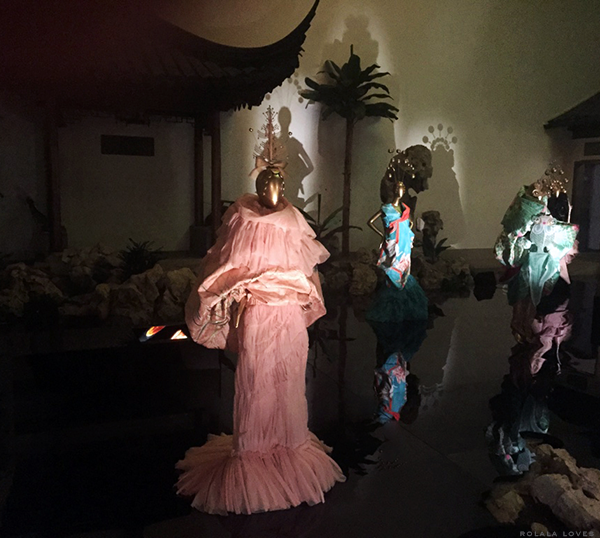 I can't believe that it's taken almost four months since I wrote about the fashions at this year's Met Gala to actually make it to see China: Through The Looking Glass at New York's Metropolitan Museum of Art. 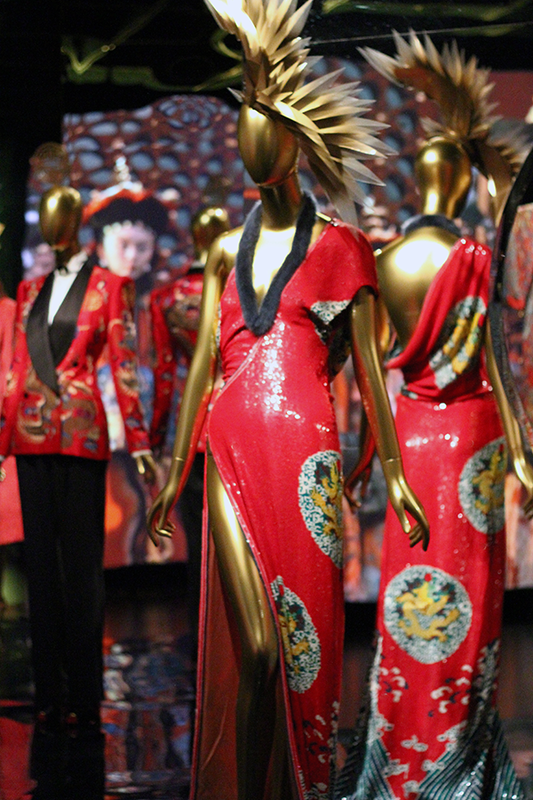 The exhibition which is a collaboration between the Costume Institute and Department of Asian Art opened on May 7 and was originally supposed to run until August 16 but due to popular demand it was extended through September 7. 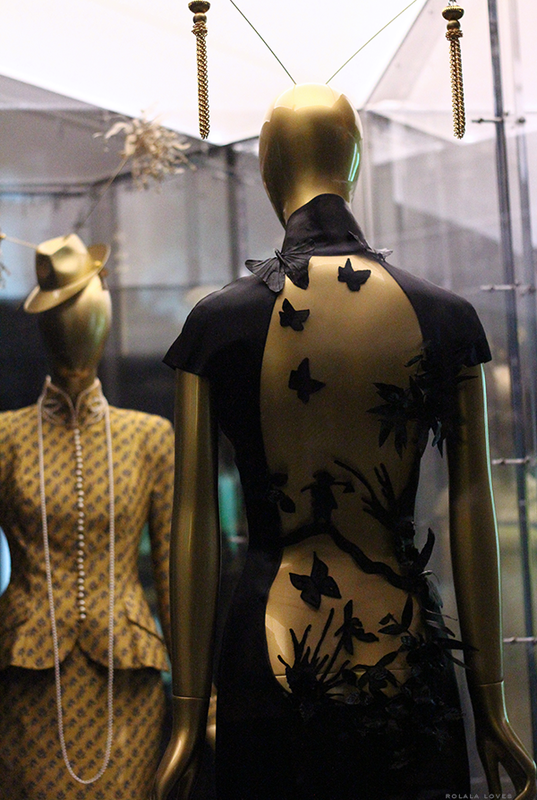 It was just reported in the New York Times that as of last Friday, the show had a record attendance of 735,000 visitors surpassing the record of 661,509 for Alexander McQueen: Savage Beauty (another incredible show!). 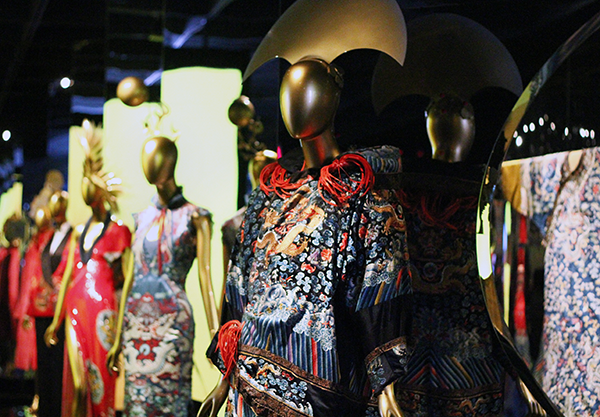 China: Through The Looking Glass showcases the connection between fine art and fashion while exploring the impact of China's influence on Western fashion through history. 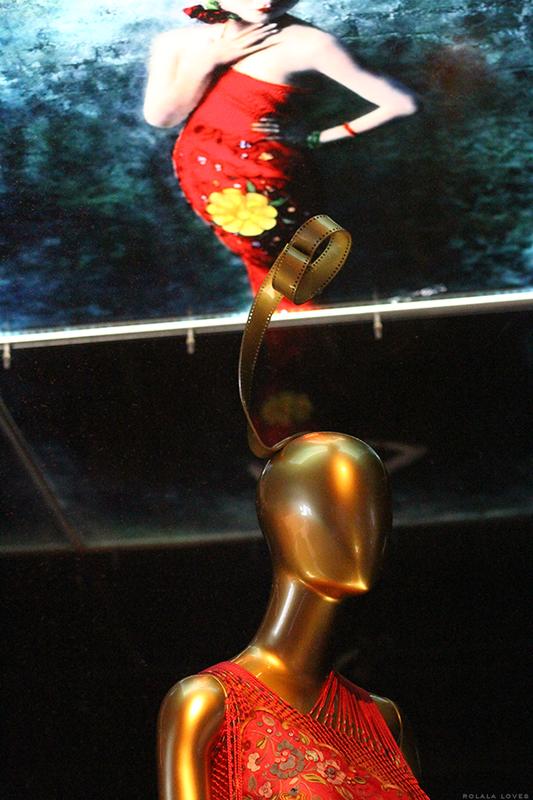 Influential filmmaker Wong Kar Wai served as the artistic director for this show and his stylistic vision and impeccable eye for detail can be felt throughout. 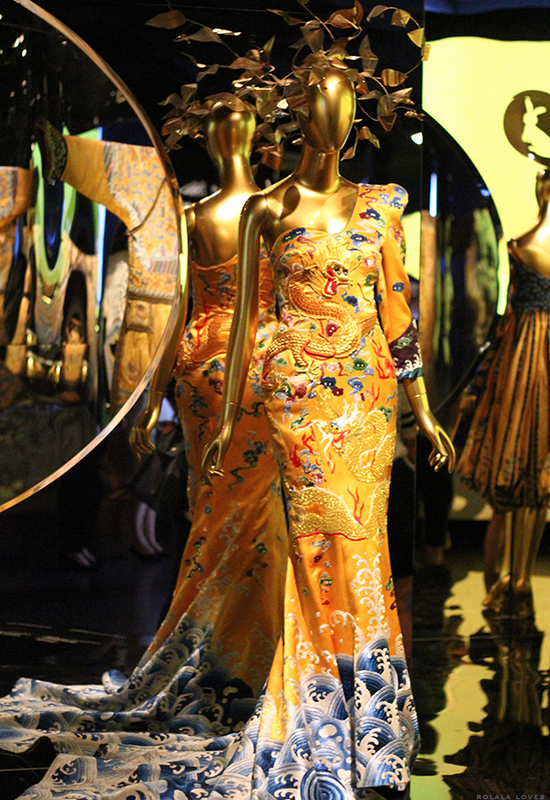 This exquisitely stunning haute couture gold gown by Chinese designer Guo Pei with a lotus flower shaped bodice and skirt was presented in a gallery of 7th to 18th century Buddha statues. Given the importance of the lotus as a symbol in Buddhism, this was the perfect placement. 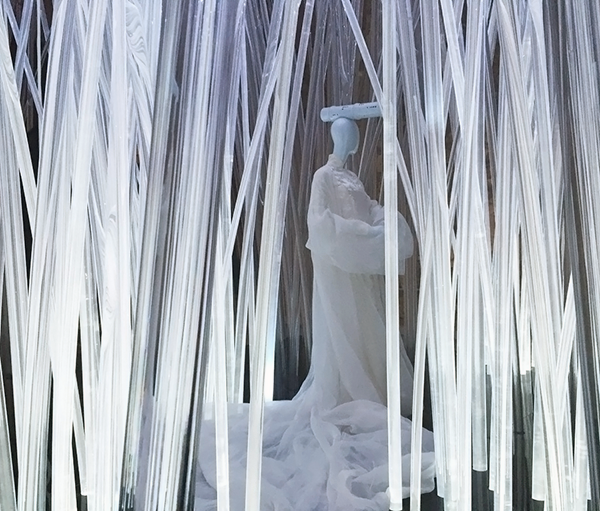 The collection of over 140 pieces is presented on multi-levels and this staging is meant to be labyrinth-like evoking Lewis Carroll's Alice In Wonderland, a nod to the "looking glass" element in the exhibition's title. 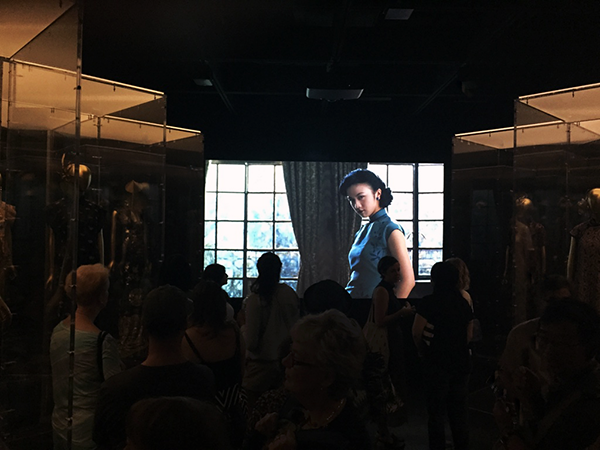 A cinematic journey is also created as significant moments in Asian film are juxtaposed within the galleries. The entire experience is incredibly captivating on a visual and sensory level. Even though we got lost and doubled back into some of the galleries a few times, it felt like I was seeing something new with each turn. 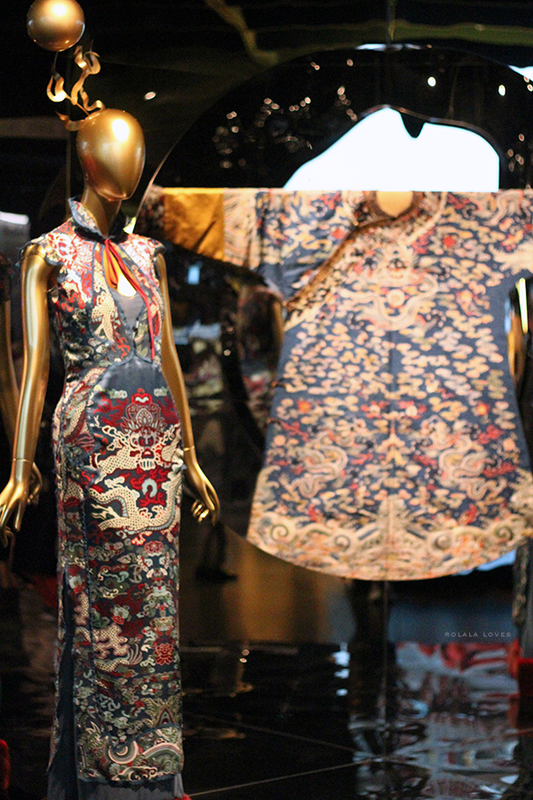 I definitely came away with an appreciation for the pervasive influence of Chinese culture on Western fashion. 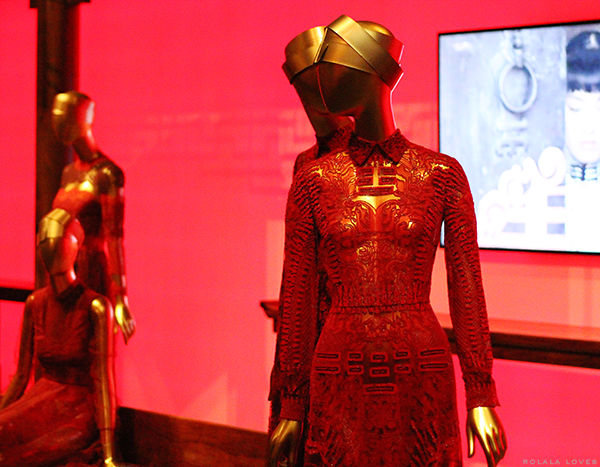 It was really undeniable especially after seeing the references presented alongside the creations they inspired. 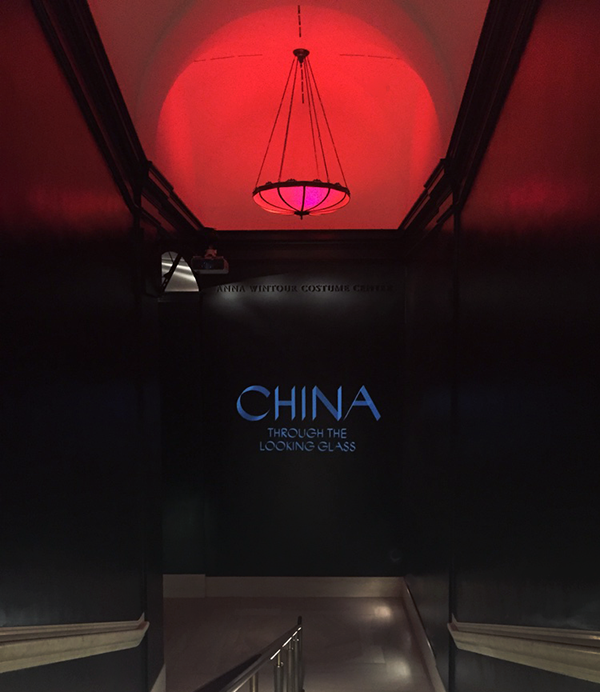 The Met has announced extended hours for Labor Day weekend so if you're in New York and you haven't seen this exhibit yet, I'd highly suggest it. 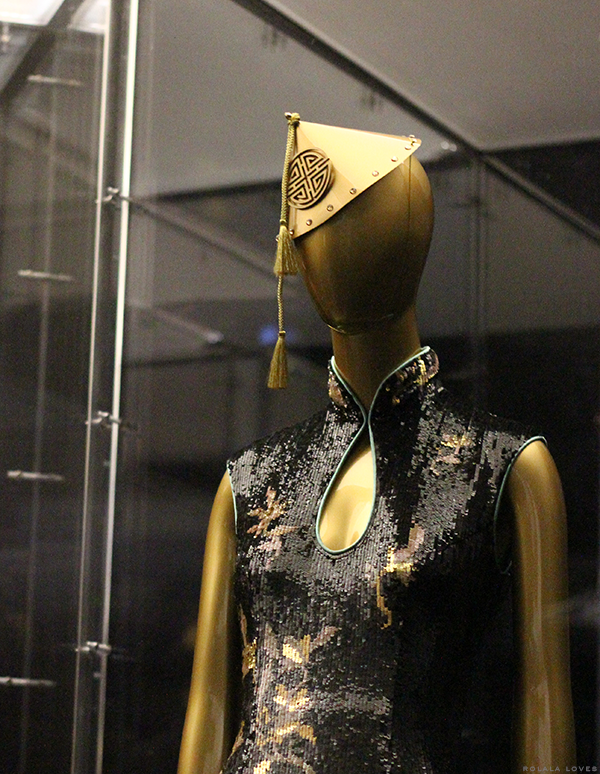 You can learn more about China: Through The Looking Glass through the museum's official website. 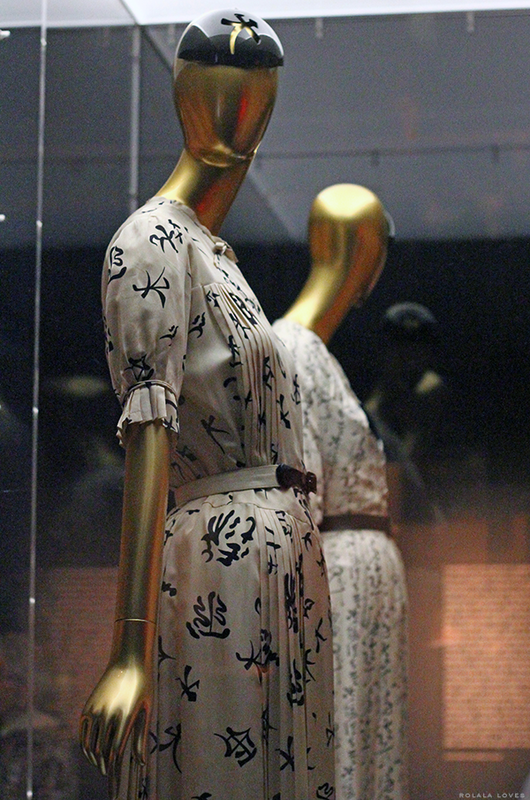 Designers featured in China: Through the Looking Glass include Cristobal Balenciaga, Bulgari, Sarah Burton for Alexander McQueen, Callot Soeurs, Cartier, Roberto Cavalli, Coco Chanel, Christian Dior, Tom Ford for Yves Saint Laurent, John Galliano for Christian Dior, Jean Paul Gaultier, Valentino Garavani, Maria Grazia Chiuri and Pierpaolo Picciolo for Valentino, Craig Green, Guo Pei, Marc Jacobs for Louis Vuitton, Charles James, Mary Katrantzou, Karl Lagerfeld for Chanel, Jeanne Lanvin, Ralph Lauren, Judith Leiber, Christian Louboutin, Ma Ke, Mainbocher, Martin Margiela, Alexander McQueen, Alexander McQueen for Givenchy, Edward Molyneux, Kate and Laura Mulleavy, Dries van Noten, Jean Patou, Paul Poiret, Yves Saint Laurent, Paul Smith, Vivienne Tam, Isabel Toledo, Giambattista Valli, Vivienne Westwood, Jason Wu, and Laurence Xu. Did you take these photos? They're beautiful! 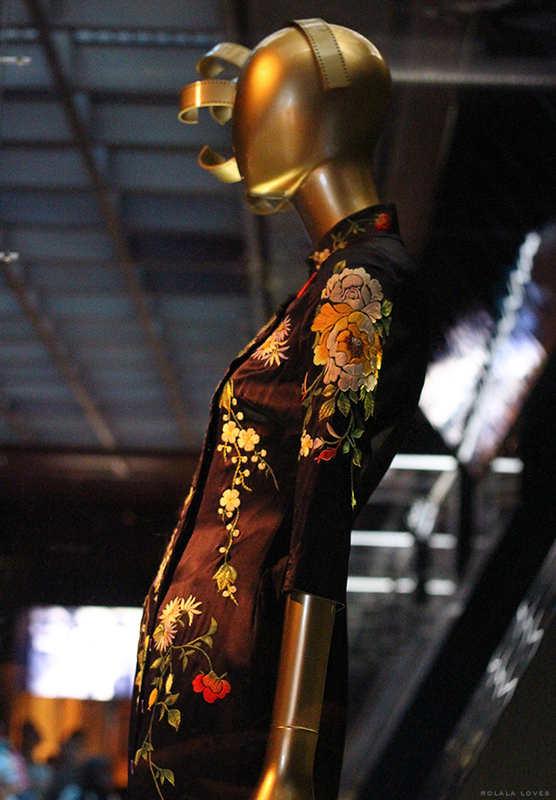 The detail on that black cheongsam was so amazing! I would LOVE to go to this exhibit. 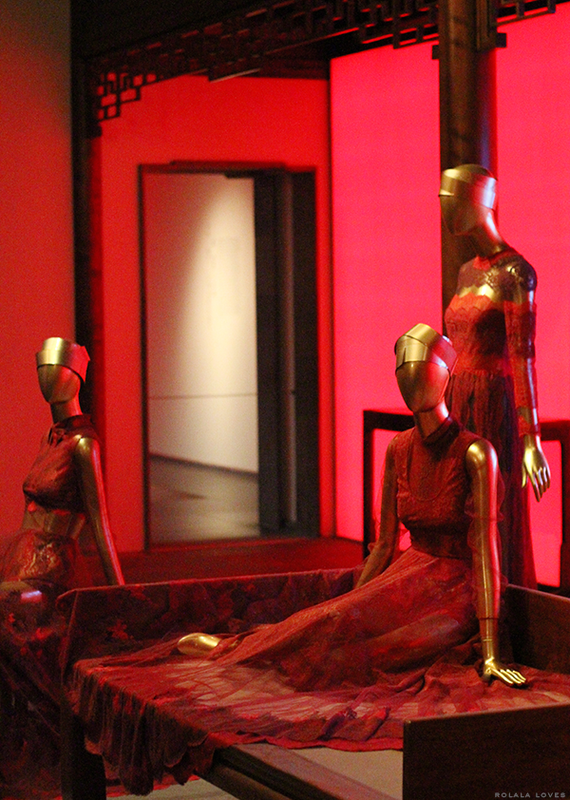 I managed to make it to the Alexander McQueen exhibit a few years back... it was so packed. I couldn't imagine how crazy it is to get into this one. Great post. I really enjoyed the celebrity intrerpretations of this theme at the Met Gala. Hi Rowena! I'd only say wow! I can't decide which of these beautiful creations I like the most! I am sure the Gala is worth a visit and if I was in NYC, I'd have visited it for sure! 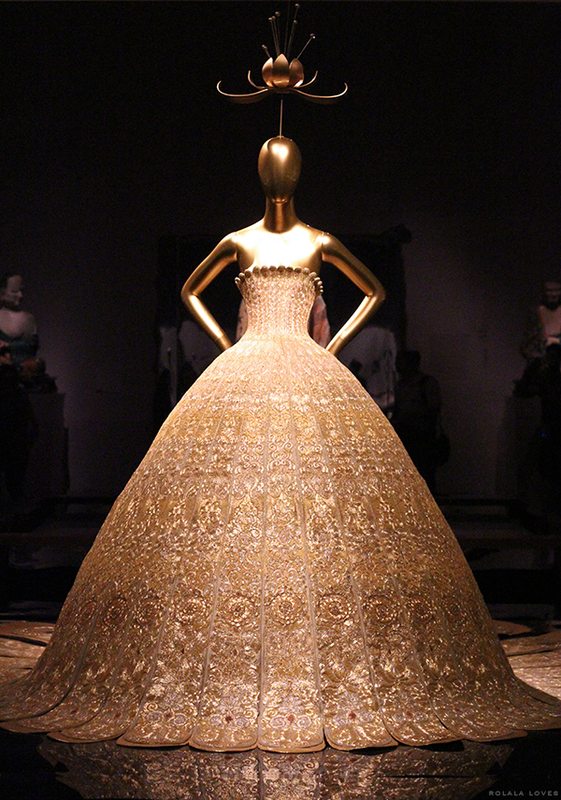 The placement of the golden dress is definitely appropriate for it! Lucky you to have had the chance to go and see! Kisses! I wish I was in NY. This would be sooooo freaking amazing to see in person. Wow these are pretty amazing! Very eyecatching! Wow I'm memorize by the first dress is jaw dropping. Oh my gosh. How amazing! what a treat--i'd love to see this! Oh wow, that is an exquisite exhibition, would have love to get the opportunity to attend it. The first picture is especially stunning, I can only imagine how beautiful it is to see it in person. Stunning pieces, Rowena. Wow, what an amazing exhibition. It just took my breath away. Gorgeous, every single piece is just gorgeous. Happy new month, girl. The pieces are absolutely stunning. M sister just walked into the room and I screamed at her, upon seeing the first picture of this post, "LOOK AT THAT, LOOK AT THAT." Testament, I'd presume. I have never attended a fashion exhibition, gallery or any event of that sort ever in my life, but I think if I were to attend one, I'd love to attend this one; not only does it explore roots of my ethnicity, the artistic vision is impeccable! Getting lost in the labyrinth, you say? But isn't that the purpose of going through the looking glass? Ha! Thank you for sharing such an amazing exhibition, Rowena! 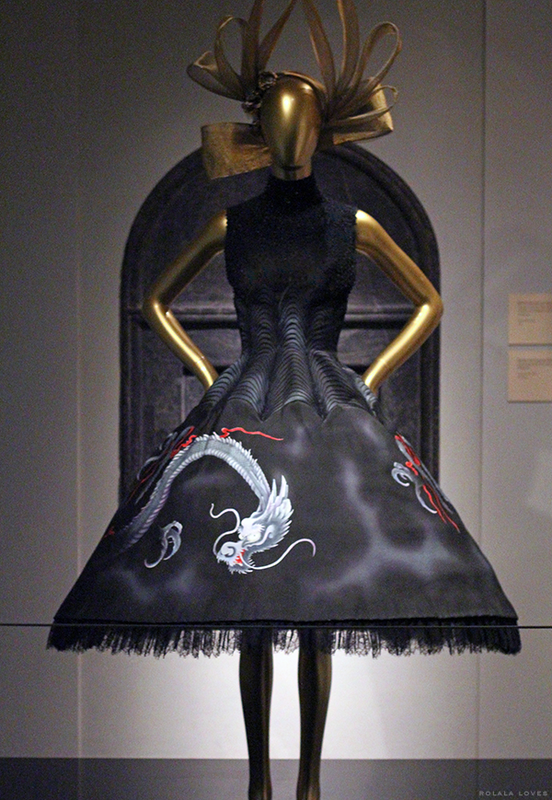 Definitely a great depiction of fine art meets fashion. Gorgeous looks! Beautiful photos! 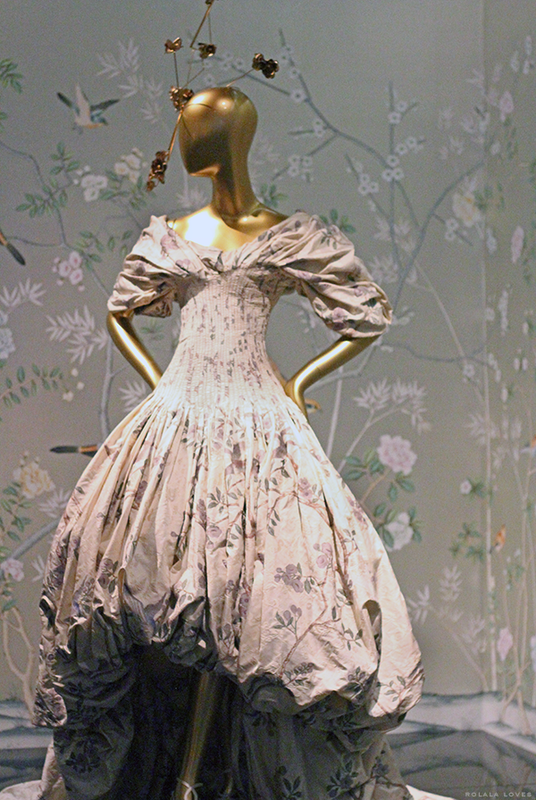 I visited NYC some weeks ago and had planned to go to the MET to see this exhibition. Unfortunately, I did not have enough time to go. I hope to go back soon before it ends. All i can say is WOW! These outfits are beyond exquisite! I am so glad you got to see this! It is wonderful, I have been twice so far! 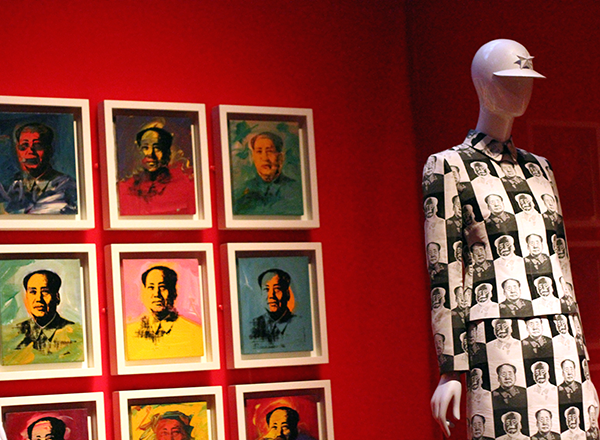 A really lovely tribute to China, it's art and culture. Bravo The Met !! Crap so mad I missed this. My step family was even in town from Paris and we didn't get here, we usually do seems the only time I get to museums. Don't think I will make it this weekend, still recovering from a heart procedure I had 3 weeks ago. I get to work and back, but not up to a lot of walking quite yet. Thanks for posting these pix. Just WOW! You've got me speechless, Rowena! 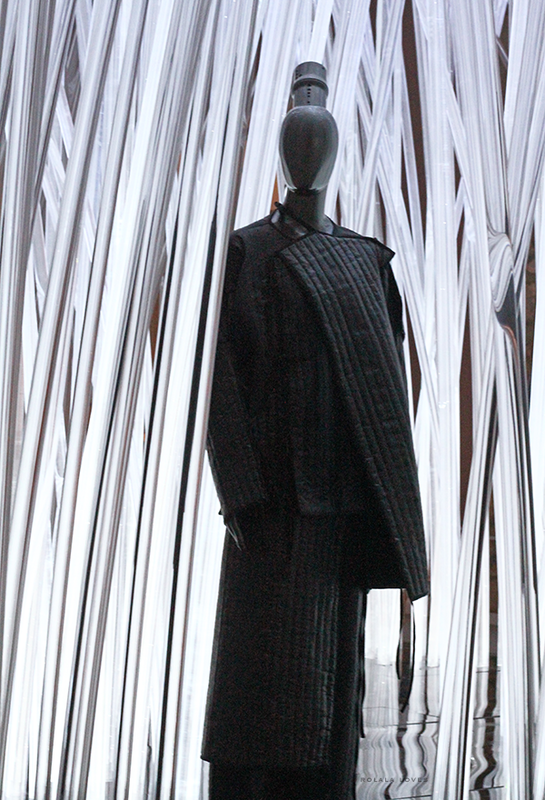 Such a great versatility of designers, I wish I could enjoy them in real life. 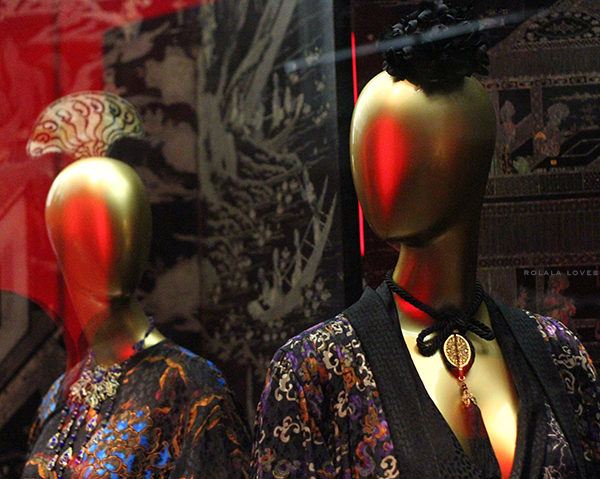 Jean Paul Gaultier's robes are my faves here - breathtaking designs! Thank you for the eye pleasure, dear Rowena!!! Hi Rowena, omg stunning dresses. 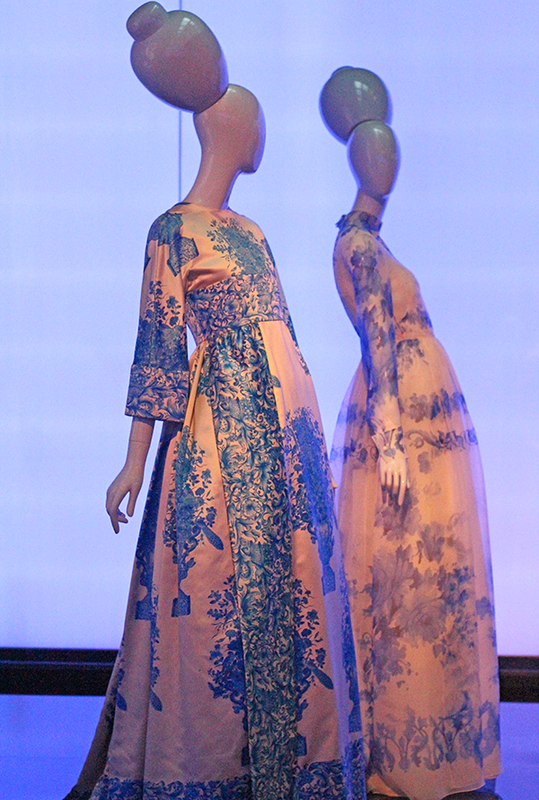 Wow, such an amazing exhibit...the clothing is stunning! So gorgeous! Wish I could see this! Stunning, just stunning. I can't believe it exceeded Savage Beauty's numbers too! Sigh, I really hope I can see it some time! The pictures say it all; it's indeed a very beautiful presentation; very rich in color and visual/artistic design. I wish I was in New york, I'll go see it too. 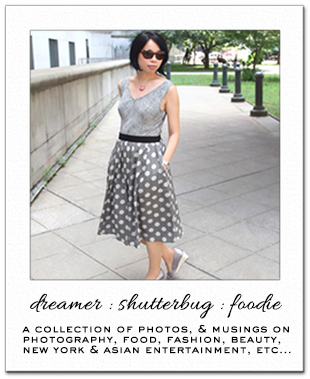 Thanks so much for sharing this on the blog. 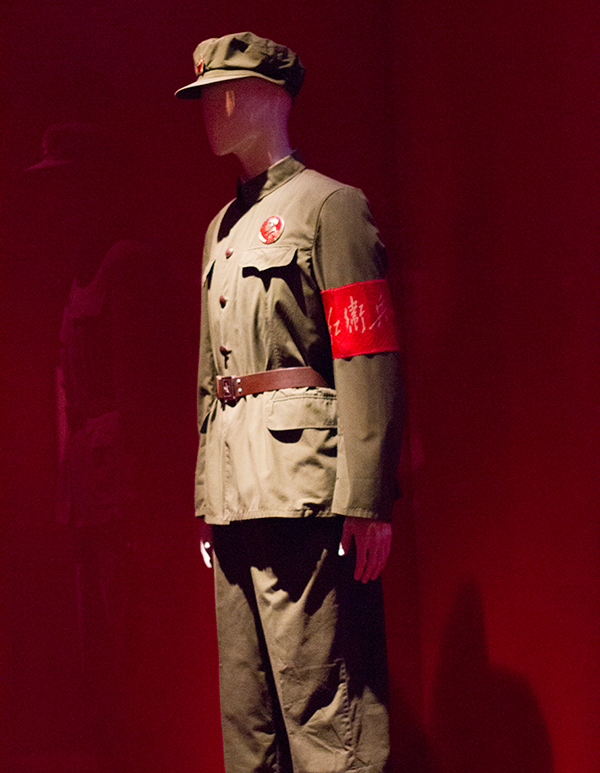 Wow, the exhibition looks stunning. I hope that I will get to see it in Europe! I felt like I have travelled back in time, or at least, journey to the East once again, with your visuals here. 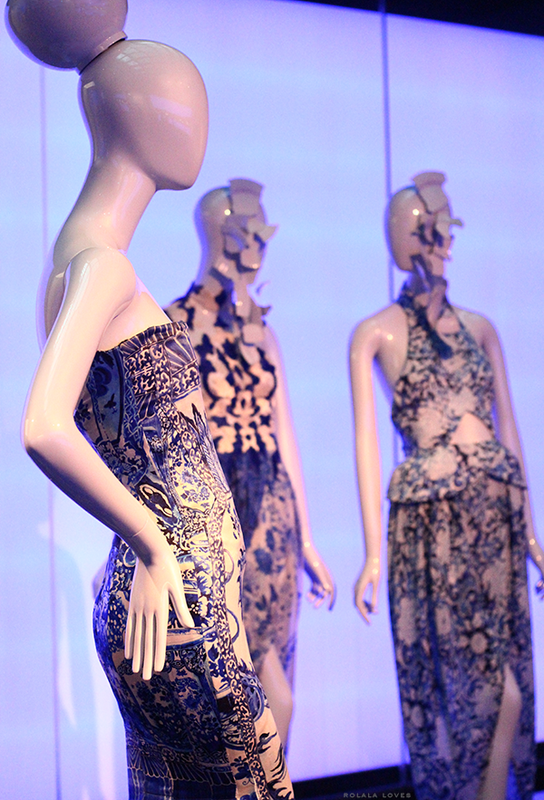 The exhibition is truly remarkable, showing such great pieces, stunning to say the least. 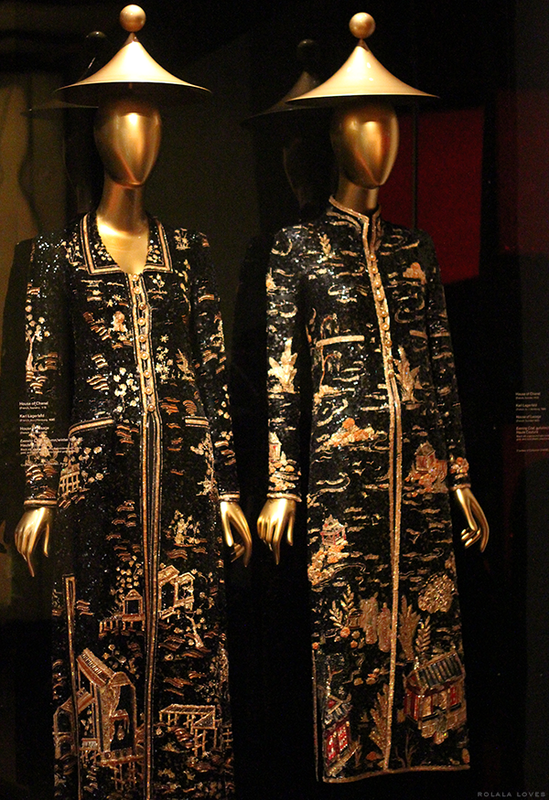 I never knew that Western fashion designers, even like YSL and Tom Ford were influenced by these Chinese designers or the Chinese cultural elements. Fascinating indeed. Well, it feels like I am once thrown back into the filmic mood of "In The Mood For Love", like Gong Li walking down the alleys of old Shanghai (or was it HK?) 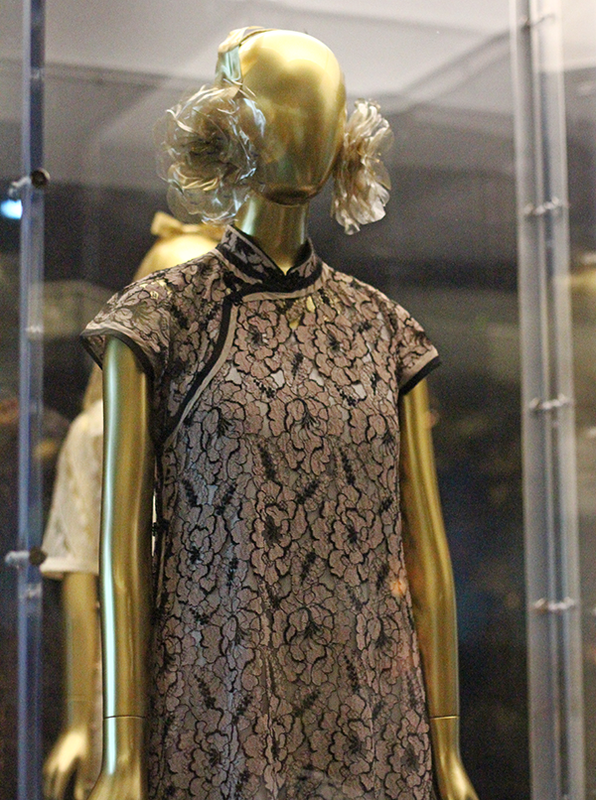 in those body-hugging qipao (but I only wish I had half her great figure she has *_^ haha), enjoying the finest of this exhibition has to offer. Thanks for sharing your experience with us! Have a beautiful week, Rowena. I really enjoyed this post. Have a fun-filled Friday! What an amazing exhibit! Wish I was in the area to see it in person. Has it really been four months? The time really flies. I'm happy to hear that such an amazing exhibition has attracted its fair share of viewers and if I was in NYC I would surely count myself as one of them. This really is an exibition not to be missed. 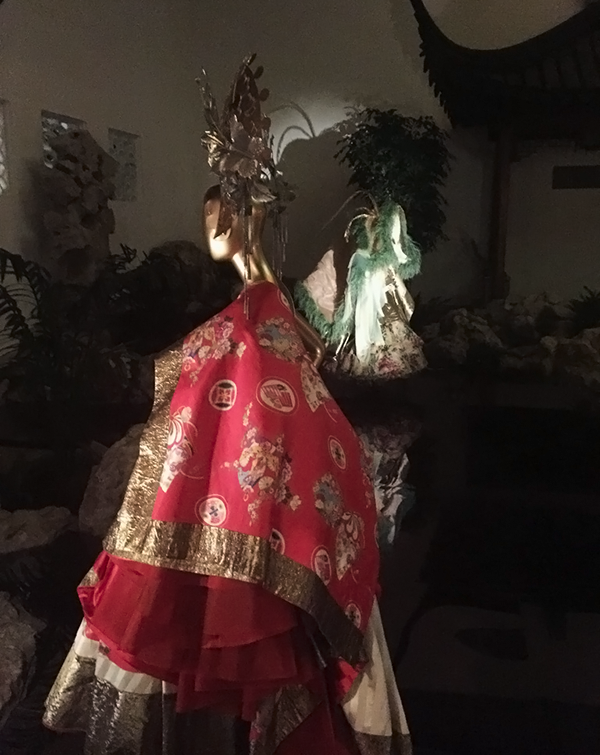 Chinese art and culture always had a fascination for the West, being so unique and being perceived as being very exotic. No wonder it atrracted so many creative people, from painters to designers. There is also the influence of history and the silk route....so there is a lot that be explored here, many refrences to make....the photographs are fantastic ! I'm sure that seeing all of these gown in person is also a great experience. However, those of us that can't make it this time are very grateful for this virtual tour. This is definitely an exhibit that I'd love to see up close and personal. 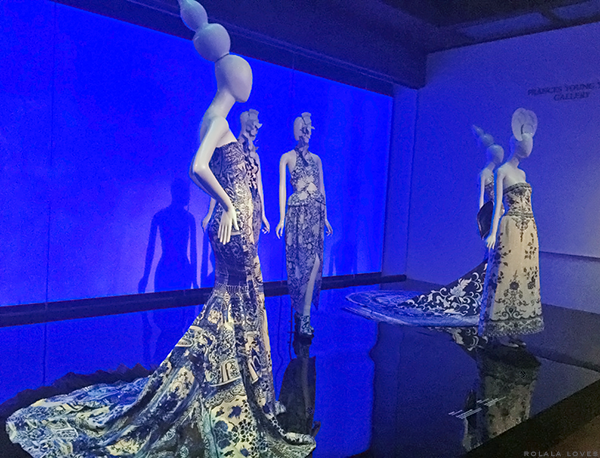 I loved the Savage Beauty exhibit when we finally saw it, and since I used to be a period costumer I am always drawn to these sort of exhibitions. Lucky for you New York seems to have everything! :) Thanks for sharing Rowena. That gold dress at the top is gorgeous! I also love the one with the waves at the bottom. You've got really wonderful photos here. Rowena, I'm so glad you got to go and see this! What a beautiful treat for the eyes! That gold dress is absolutely a STUNNER! 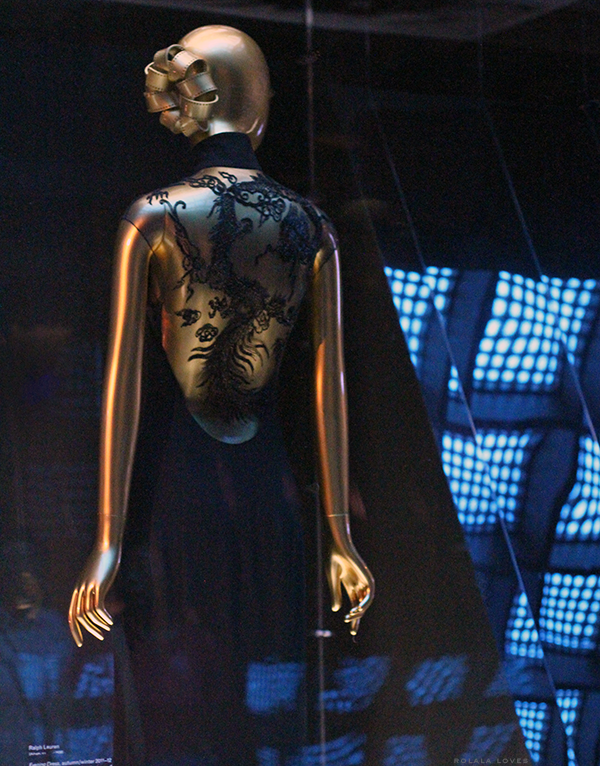 I also love the black dress with the back detail. So pretty. Thanks for sharing these with us. I saw your post on Instagram and just had to come over and see the rest! What a great selection of photos! I wasn't really aware of this so thank you for all the information and photos. I was so shocked that it received more visitors than McQeen's show!